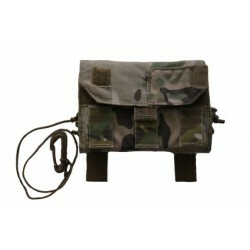 Military tactical cell phone admin utility pouch by TYR Tactical. Great protection for your phone and accessories. Official name is "TYR Tactical Motorola ATRIX Pouch"
Berry compliant. Made in USA. Made to hold a Motorola ATRIX phone with Otterbox case (Phone or Otterbox case not included.) Will hold a iphone 4S size or similar size phone as seen in picture with case (Phone is not included, only illustration). There is no opening on top left side. There is opening on right side. Detachable nylon phone case with velcro backing and paracord clip. Can attach to something else with the side elastic velcro straps. No screen cover. Size of detachable cell phone case part is approximately: 5" Length x 3" Width x 1" Deep. Approximate size closed: 5.75" Length x 4.5" Height. Great overall case designed for military ops. Extremely durable. 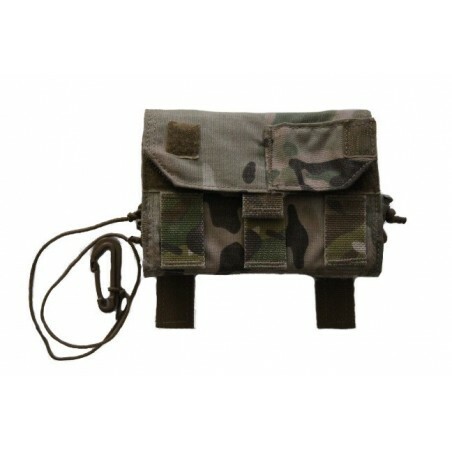 Can attach to your backpack, vest or other MOLLE webbing. Fair: May have minor holes, rips, tears. Sun fading. Heavy wear on fabric. In usable condition. May be missing paracord string. Good: Will have sun fading, fabric wear. Paracord and velcro areas may show signs of wear. In working order. Like New: Minimal wear. Shows light use. Minor imperfections.